Greetings again from the darkness. Welcome back Ethan Hunt, and the other members of IMF. This is the 6th film in the franchise born (not Bourne) from the classic TV series (1966-73) created by Bruce Geller (credited in each film). Writer/director Christopher McQuarrie returns for this companion piece to his 2015 MISSION: IMPOSSIBLE ROGUE NATION, as of course does mega-star Tom Cruise as the aforementioned Ethan Hunt. Hunt’s team of Benji (Simon Pegg) and Luther (Ving Rhames) returns, as does really really bad guy Solomon Lane (a glowering Sean Hayes), and MI6 agent Ilsa (Rebecca Ferguson). New to the scene is Agent August Walker (Henry Cavill, MAN OF STEEL), a hulking hunk of a man who doesn’t share Ethan’s belief in brainy strategy. Speaking of strategy, I was a bit tricky in inviting a friend to the screening who is in the midst of a years long boycott of Alec Baldwin movies. Although I felt a fleeting twinge of guilt, I believe the payoff was such that it lessened the impact of deception. Also appearing are Angela Bassett as a CIA toughie, Michelle Monaghan, Wes Bentley, and Vanessa Kirby (“The Crown”) as White Widow. Most fans of this franchise have likely accepted that the stories are overly intricate – this one is unnecessarily jumbled – and they just enjoy the clamorous ride to an ending that typically has something to do with a bomb and saving the world. It’s the action and stunts that drive ticket sales, and this one has the most extreme and over-the-top action sequences we’ve seen yet. Even though there is a familiarity to some, the stunts are still quite impressive; and yes, Mr. Cruise, now in his mid-50’s, still performs his own stunts. This includes the leap between buildings where he actually suffered a broken ankle, shutting down production for a few months. The jump where he was injured is included in the film. And fear not, the Cruise Sprint is in full force on numerous occasions. Sadly, there is also a quick shot of a Ving Rhames jog – nothing but painful to watch. The film opens with a wedding day nightmare, but quickly moves to what the fans want – globetrotting, chase scenes, slick advanced technology and wacky stunts. The streets, bridges and landmarks of Paris are on full and spectacular display, while the chase scenes occur on foot, on motorcycle, in cars, and in helicopters. Crazy stunts include HALO jumping, rock climbing and dangling from an elevator shaft. There is a relentless brawl scene in a men’s room where Hunt gets face planted into a porcelain sink and thrown through a wall … and thanks to the magic of Hollywood, five minutes later, he has nary a scratch and looks as debonair as James Bond ever has. However, it’s the final helicopter sequence through the mountains and cliffs of Kashmir that provide the signature moments of the film. Even with the nod to JURASSIC PARK, it’s a breathtaking scene. 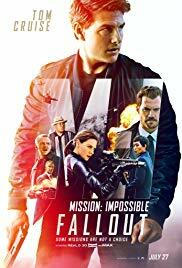 Running nearly 2 ½ hours, this is the longest of the MISSION: IMPOSSIBLE films, and Ethan Hunt remains, along with Maverick in TOP GUN (sequel filming now), the best fit for Tom Cruise the actor and celebrity. Unfortunately the same can’t be said for Henry Cavill. He’s blessed with extraordinary genes – just not the thespian types. Filled with double and triple and quad crossings, whether you can follow the story or not, only the most stoic would claim you will find this anything less than an adrenaline rush … should you decide to accept. Plus, it still features one of the best theme songs ever – especially powerful with today’s phenomenal theatre sound systems. Thanks Lalo Schifrin.